Inspired by desserts, Thorntons have selected Banoffee Pie, Hot Cross Bun, Raspberry Cheesecake and Fudge Brownies to turn into Easter Eggs. We have already reviewed the Banoffee Pie flavour which is a milk chocolate egg, now we are reviewing the dark chocolate Thorntons Fudge Brownie Easter Egg. Elegant and tasty decoration in the form of a vertical platter on the front of the egg, includes biscuit pieces, walnuts and Thorntons' deliciously creamy fudge. Presentation-wise this is a glamorous Easter egg and Thorntons want you to know this, which is why it's in a transparent plastic box. Chocolate fudge brownies are usually sweet and quite rich. The richness of the brownie is reminiscent here, but the sweetness isn't. Thorntons 60% minimum cocoa solids chunky dark chocolate is bitter, as good quality dark chocolate should be. When left to melt on the tongue, the chocolate's earthy and dark flavours can be really appreciated, together with the incredibly velvety texture. We’d be surprised to see someone finish this 425g large and rich egg on Easter Day, we’ve made ours last over a week. 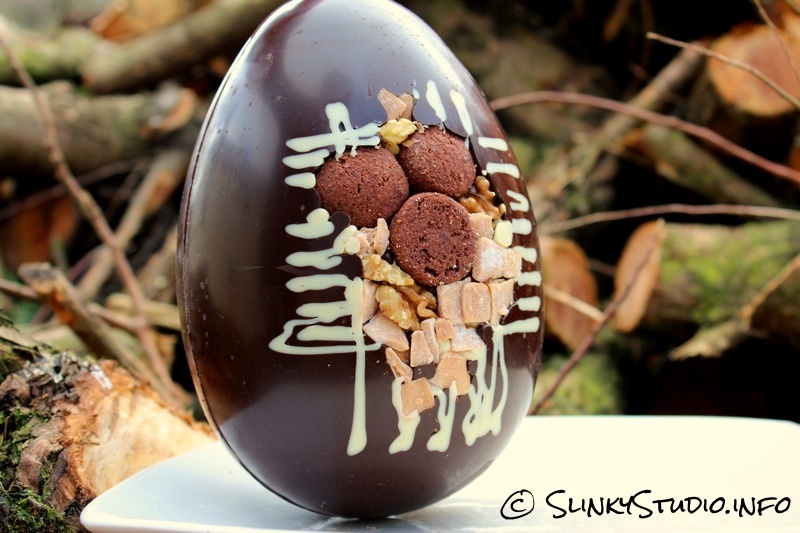 But each time you do revisit the egg, you definitely appreciate the fine flavour of the chocolate in small helpings. The deliciously dark chocolate can be enjoyed free of additions most of the time, with occasional biscuit pieces making a welcome appearance, but the fudge and walnuts are just displayed on the front of the egg and are not blended into the chocolate. The Thorntons Fudge Brownie Easter Egg doesn't really taste like a fudge brownie, which may disappoint some people; it really simply takes its inspiration from the ingredients of a fudge brownie. The Thorntons Fudge Brownie Easter Egg is strictly for dark chocolate soul mates. We like where Thorntons have gone with this one, but we think we should reinstate that this egg doesn't really taste at all like a fudge brownie.